My post The Lady Of The House elicited the comments of how fast time has flown as I had written about their wedding five years ago. Those comments have inspired this post. This entry was posted in Blogging and tagged Awesome quotes. Bookmark the permalink. Some lovely posts here Ramana, I remember well when you first wrote about Manjiree and the changes in your life. I am so happy that you are all so blessed in each other. Thank you WWW. Your sentiments gladden my heart. All I can say is time is zipping by. It’s going faster and faster. That it is Monk, that it is indeed. Time is such a fluid thing, running fast or slow to each person according to their internal state. In the Indian philosophical systems, Time itself is Maya, or illusion. it’s an amazing phenomenon really. the sense of time. my days are lovely. some are long and some are short! but the years? I seem to mark each one now by Christmases. LOL! why? I don’t know. my mother loved Christmas. maybe that’s why. I had gone visiting my nephew and his young family yesterday and since I had a 150 Km drive in the rains ahead of me, I wanted to leave early but, they would have none of it. Their idea of time spent by me with them was one of inadequacy whereas mine was one of satisfaction and need to get away quickly! Same situation, two different thoughts about it. Each one of those is so true! It is and it fascinated me. You are bang on and yes, SAW’s comments are very apt from her perspective. 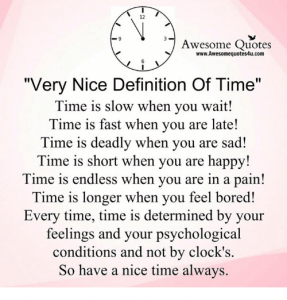 Time simply is – how we choose to measure it is what is ever changing. Instead of measuring if we simply accept its ephemeralness, we can be more comfortable. In deep meditation, I find that time has meaning ONLY when there is a change; when no change takes place, time loses meaning. Similarly, space gives me meaning only on perceptible change, without which space loses meaning. Glad to see you back here Raj. I see where you come from. I did not want to bring in our philosophical system into the post for obvious reasons. Thank you for commenting. 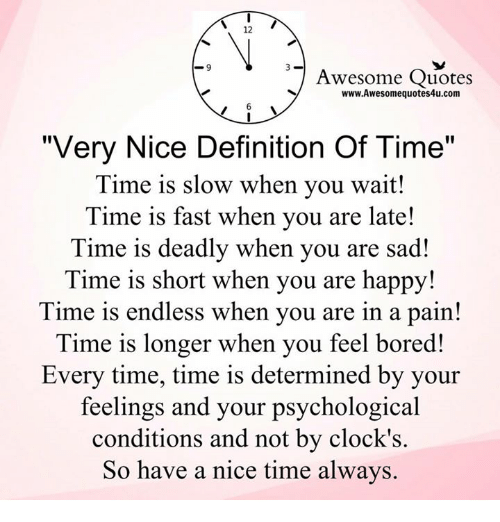 I find when you have “times when time is just right” through to “hurry up and get to the end of the period” – this second reason – a lot to do with some aspects of my life right now!